Did you know that based on what the Greek government, Europe, and the IMF is doing with regard to taxation that there is no maximum legal taxation by any government when compared to pensions? This means that with the current system Greek retirees face expulsion from their own homes because taxation is beyond their ability to pay. * First 20,000 is taxed at 22%, an additional 100% of current tax is required as prepayment for next year. ** 2,100 for taxpayers with three children. *** The general population does not know where or what or how this money is being used. In addition to these taxes, the government levied a real estate or property tax called ENFIA. The yearly amount averages over 2,000 Euros for most families which is required to be paid during the last four (4) months of the year plus the first month of the new year. At the same time, the average pension being about 12,000 Euros per year less the cost of living (food, utilities, medical, pharmaceuticals, not to mention children) are forced to reduce everything to be able to pay the ENFIA for fear of lossing their homes. Over taxation is creating poverty even though people who are legitimate home owners and who having nothing more than a pension for income are now threatened with the possibility of lossing their homes. I am not referring to people who have bought homes when prices where bloated and with a minimal or no down payment. That category of home owner is doomed to have their homes sold by the banks and will unfortunately have to accept that the loan that they repay is nothing more than rent. You might say, "well they can sell their homes", but at the same time the government has destroyed property values by over 45 percent which means that a home owner would be giving their home away. 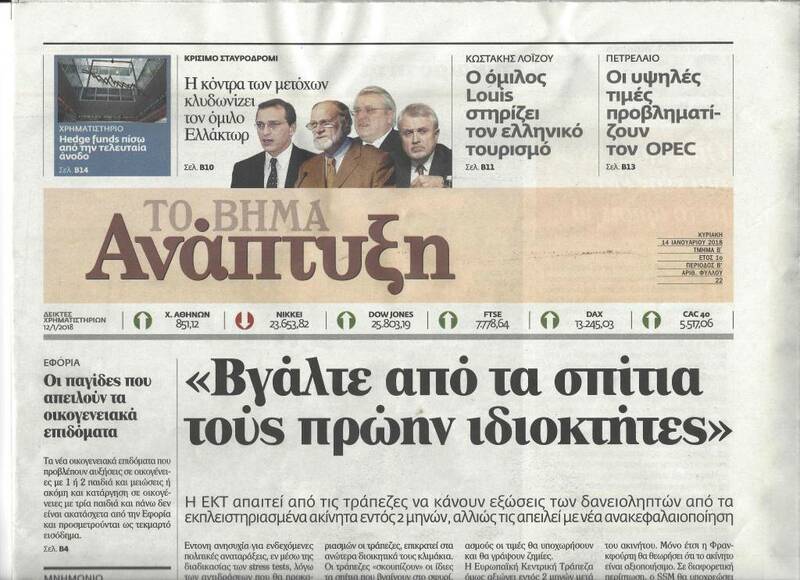 See the Greek newspaper TO BHMA Sunday business section January 14, 2018 front page heading "Βγάλτε από τα σπίτια τους πρώην ιδιόκτητες" which means "Throw them (home owners) out of their homes", which the government of Syriza claims is an order by the ΕΚΤ wich is the European Central Bank (ECB). My point of view is that taxation must not be more than a small percentage of a pension for those that have no other income. "The legal definition and the economical definition of taxes differ in that economists do not regard many transfers to governments as taxes. For example, some transfers to the public sector are comparable to prices. Examples include tuition at public universities and fees for utilities provided by local governments." According to information on Wikipedia. "The levying of taxes aims to raise revenue to fund governing and/or to alter prices in order to affect demand. States and their functional equivalents throughout history have used money provided by taxation to carry out many functions. Some of these include expenditures on economic infrastructure (roads, public transportation, sanitation, legal systems, public safety, education, health-care systems), military, scientific research, culture and the arts, public works, distribution, data collection and dissemination, public insurance, and the operation of government itself. A government's ability to raise taxes is called its fiscal capacity." "When expenditures exceed tax revenue, a government accumulates debt. A portion of taxes may be used to service past debts. Governments also use taxes to fund welfare and public services. These services can include education systems, pensions for the elderly, unemployment benefits, and public transportation. Energy, water and waste management systems are also common public utilities." "The Laffer curve assumes that no tax revenue is raised at the extreme tax rates of 0% and 100%, and that there is a rate between 0% and 100% that maximizes government taxation revenue." This economic theory for those who believe economists proves that over taxation means little or no revenue for governments. "Hauser's law is the proposition that federal tax revenues, in the United States, since World War II have always been approximately equal to 19.5% of GDP, regardless of wide fluctuations in the marginal tax rate." Hauser's law means that no matter what the government spends they will levy taxes based on a rate that they set. W. Kurt Hauser is the author of Taxation and Economic Performance (Hoover Press, 1996); his research on the relationship among tax rates, federal government revenues, and economic growth has become known as Hauser’s Law. For the past decade he has devoted his time to researching the origin, evolution, development, and ubiquity of global slavery. Even Denmark, part of a real socialistic framework, has a "Maximum income tax level which is the sum of all income tax percentages (municipal income tax, state income taxes and the central government income tax financing health care in the Regions called health care contribution (Danish: Sundhedsbidrag)) cannot exceed 51.5%." 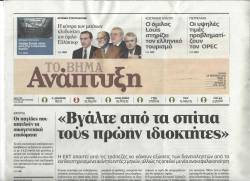 So if we assume that taxation is levied based upon productivity then the Greek government is illegally over charging its citiizens with the help of Germany and the EU as its supporters to promote public administrations is favor of its pseudo socialism which does not more than insure jobs for votes. There must be a cap to the spending and costs that a government and it must be either a set percentage or less than 10 percent of the GDP. "Tax revenue is defined as the revenues collected from taxes on income and profits, social security contributions, taxes levied on goods and services, payroll taxes, taxes on the ownership and transfer of property, and other taxes. Total tax revenue as a percentage of GDP indicates the share of a country's output that is collected by the government through taxes. It can be regarded as one measure of the degree to which the government controls the economy's resources. The tax burden is measured by taking the total tax revenues received as a percentage of GDP." OECD data "general government spending is basically defined, as a share of GDP and per person, provides an indication of the size of the government across countries. General government spending generally consists of central, state and local governments, and social security funds. The large variation in this indicator highlights the variety of countries' approaches to delivering public goods and services and providing social protection, not necessarily differences in resources spent." Greece which is only a country of 10M people is the top 3rd in the chart while its revenue is less than that for the year 2015. In essence, countries like to hide what they do by creating differences that cannot be easily compared. If you search for "government spending" or "maximum limit government spending expenditure" you will see that they have created a least two different sections. One for general government spending and one for central government spending which are then broken into mandatory and discretionary spending. Once again Greece over spends at the cost of taxation paid by the people as shown in Table 3. List of Countries as a rank % of GDP to which Tax burden % GDP is 31 and Govt. expend. % GDP is 52, spending almost double its revenue at the cost of taxpayers. Therefore, in agreement with Hauser's law, we are all global slaves to taxation until governments cease ridiculous discretionary spending and place limits on mandatory spending. Need more proof, then see the paper on "The Impact of Government Spending on Economic Growth". Education is deliberately being reduced by governments because they know that "knowledge is power", a aphorism which is from a Laconic phrase from the Greeks of Laconia, but in today's world, knowledge is available for everyone via the Internet, so make proper use of the information and legally fight for your rights. If there is any justice then over taxation must be declared illegal!